Some Ubivox customers create a new list before a delivery, then import the recipients to the new list (we don't recommend this). Normally this is done if the customer is storing their recipients in another system, which takes care of the subscriptions and unsubscriptions. In other words, a separate database with recipients. This procedure can cause some problems. These are described here and a solution to the problem is provided. 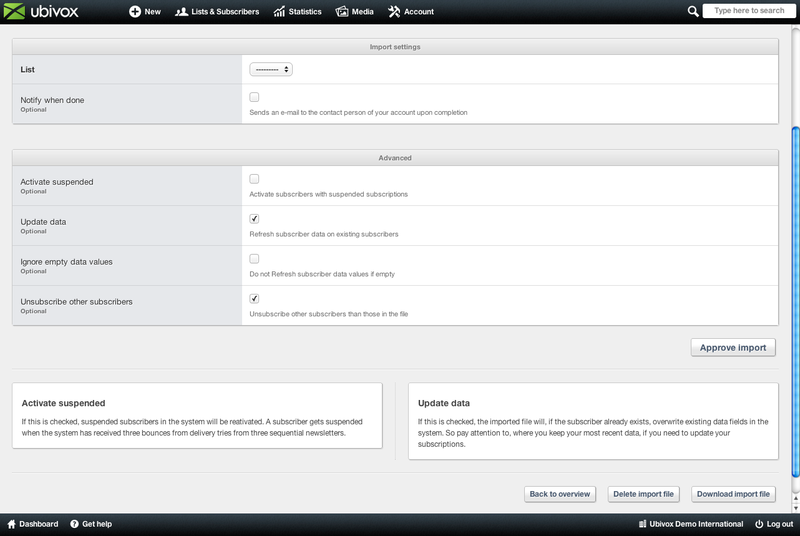 In Ubivox, a subscriber can subscribe to several lists at the same time. An unsubscription though, will only be registered on one list. This means that if you create a new list before each delivery, then the unsubscriptions on the old list, will not be registered on the new list. You thereby risk sending to recipients that unsubscribed from an earlier newsletter, and a different list. Ubivox also collects bounces, and after three deliveries with bounces, the recipient will be unsubscribed from the list. If you create a new lists each time, the bounced e-mail addresses will never be unsubscribed, and you will send e-mails to inactive addresses, thereby sending a lot of unnecessary e-mails. When importing, check the box Update data to refresh subscriber data on existing subscribers, to make sure that all information is up to date. Then check the box Unsubscribe other subscribers to make sure that only the subscribers you import are going to be on the list. The existing subscribers who already are in Ubivox and therefore not on your imported list, will be suspended. This process makes sure that you only have to use one list in Ubivox, and avoid problems with sending to unsubscribed recipients.